Our Sweet Bars are made from scratch when you place your order. These decadent cookie bars feature a generous share of chocolate chips layered with sweetened condensed milk and a graham cracker crumb base. 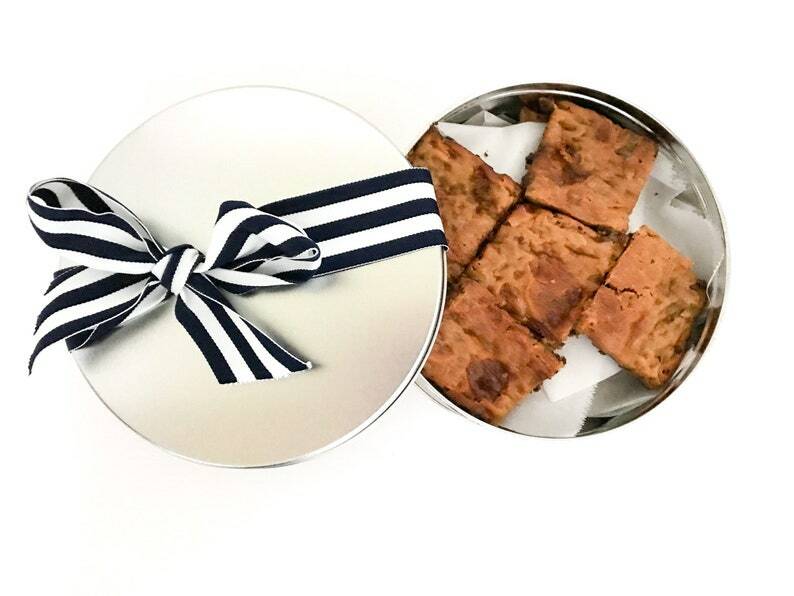 A third generation family recipe, these scrumptious bars are sure to be a favorite with the whole family. We use only the finest ingredients and make all our products by hand in small batches. Approx. 15 cookies (about 20 oz) in 7 3/16" diameter cookie tin. Bars are approx. 2" x 2 1/2". This is my 3rd order from Apple Mill Bakery. I have been very pleased each time. I ordered 2 tins of Sweet Bars to bring to a family gathering. They arrived quickly, were packaged very well, and were fresh and absolutely delicious! Will order again. A great "homemade" gift idea for Christmas or any time of year. This shipped promptly and it was received in time for an anniversary gift. It was for a 10th anniversary so having it arrive in a tin was perfect! The family told me the cookies are delicious and there was a generous amount and they were not broken or messed up during shipping. I would highly recommend this bakery!